We feel the wind, but we don't see it. 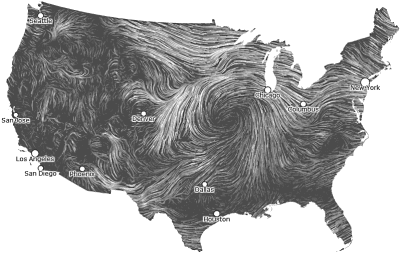 Perhaps that's what makes this wind map from data visualization researchers at HINT.FM so compelling. Wind Map Source - HINT.FM data visualization website by Fernanda Viégas and Martin Wattenberg who lead Google's "Big Picture" visualization research group. In its current form, the wind map depicts a satellite view of wind paths and intensity within the outline of the United States. There are plans to extend the map over the entire earth. 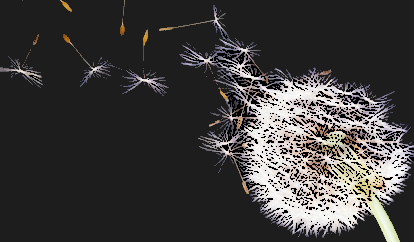 Viewed in hypnotizing real-time visualization, the paths of perpetual wind suggest a focused but random purpose. Black areas represent regions of calm, while curvilinear white lines are high winds. The spectrum of wind intensity is represented in shades of gray. On a given day, one might see winds pouring down from Canada, a highway of gulf air flowing into the nation's mid-section, or the western slope of the Rockies getting buffeted by an eastward flow. Higher energy states move toward lower energy states. The downhill movement of air from high to low pressure is the driving force behind wind, but wind is also deflected by the earth's rotation around its own axis. Wind is deflected to the right in the Northern Hemisphere and deflected left in the Southern Hemisphere. Most of earth's physical phenomena, including wind, demonstrate cause and effect. ...nature's laws are causal; they reveal themselves by comparison and difference, and they operate at every multivariate space/time point. The 5-Whys is a question-asking technique to explore cause-and-effect relationships. Sometimes this technique converges to a root cause. A variation of The 5-Whys is 5-Whats. Starting with What cause of wind? asking the 5-Whats of Wind seems like a promising tack, but soon diverges from root cause to the cosmological. What causes wind? Pressure differences. Air flowing from high atmospheric pressure to low atmospheric pressure. What causes atmospheric pressure differences? The warming and cooling of air changes its density, which increases or decreases pressure. What causes the warming and cooling of air? Warming occurs from incident solar energy; the highs of the day to the cool of nights, also known as diurnal temperature variation, are caused by the earth's rotation. What causes the earth's rotation? The earth spins because of the way it was formed -- a huge cloud of gas and dust that collapsed under its own gravity. As the cloud collapsed, it started to spin by inertial force (like when a skater pulls in his arms then spins faster). The earth spins because there are no forces acting to stop it. What causes the huge cloud of gas and dust that coalesces into the planet earth? The early development of the universe, also known as the Big Bang theory. The answer of wind, and its patterns, lies somewhere between invisible variations in atmospheric pressure and the Big Bang.